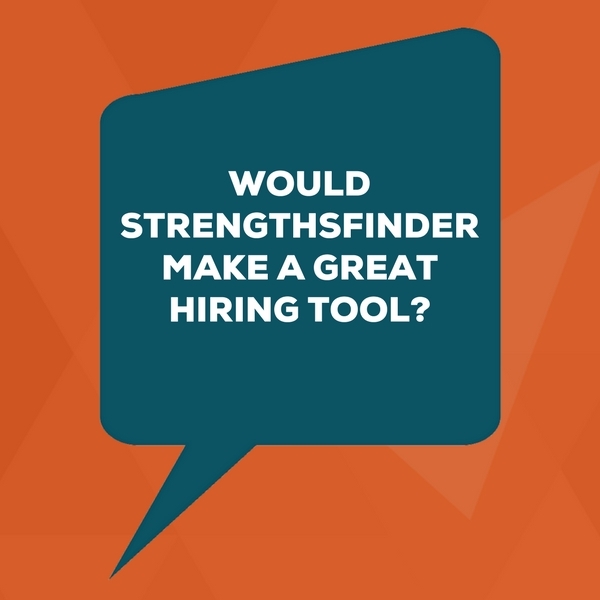 In this episode, Lisa answers the question: Would StrengthsFinder make a great hiring tool? Although it might seem logical, once you dig a little deeper, you’ll realize it’s not a great idea. But don’t despair — Lisa also gives you tips on how to use your team’s natural Strengths to compensate for the ones it is lacking. I’m with you. That feels totally logical, yet there are at least 5 reasons that this idea is flawed. Yup, I’m telling you that StrengthsFinder isn’t a hiring tool. Whahhhn. Wahhhn. So hang on. If you’re thinking that you want to use it to vet your candidates, slow down juuuuuuust a sec while you consider the whole picture. Take two candidates: Madison and Abraham. Madison’s #2 talent theme is Focus. You’re psyched because that’s the talent you’re missing on your team DNA charts. Abraham has Focus at #10. So on the surface, Madison wins because she has that elusive talent you’re looking for. But wait! One thing you need to know about the tool is that it tells you each person’s top talents … for them. But it doesn’t give you a measure of how well developed that talent is. And it doesn’t give you an intensity level for that talent theme. So Abraham’s #10 Focus could be stronger and better developed than Madison’s #2 Focus talent. CliftonStrengths (or StrengthsFinder as many of us know it by), is a tool offered by Gallup. Gallup is well known for their research, and they take their tools seriously. They designed the assessment as a professional development tool rather than as a hiring tool. They recommend offering it to new hires when they join your company on their first day of work. Imagine what a cool change-up that would be: being a new hire, coming in for your first day, and spending your onboarding experience learning more about what will put you at your best. That sounds so much better than filling out benefits paperwork all day! Gallup does, in addition to CliftonStrengths, have a consulting practice around Analytics Based Hiring. They have a whole segment of their business focused on employment, predictive analytics for a role, and custom assessments for hiring. Most listeners will be saying, “Thanks Lisa, but I don’t have a five or six figure budget for that kind of consulting.” No worries. Of course, the main thing is to know how the research scientists designed the tool so that you don’t get yourself into liability-hot-water. Here’s the thing. If you tried to act on that thought, you would be creating a search for a needle in a haystack. See, the Command theme is the least commonly seen talent in the entire database. A small percentage of people will have that theme. And once you find this elusive person, they may not be qualified for the job. You could take this deficit mentality and start obsessing over how your current team doesn’t do well with written plans. But don’t lose sight of the bigger goals. Ask yourself: What are the outcomes your team is responsible for? Do you currently meet them? If you do, you probably use the existing talents you have in a way that acts like (or gets the same results of) a talent theme you’re missing. So maybe you have a person on the team with Activator who gets projects off of the starting blocks. And another guy with Arranger and Adaptability who shuffles things around seamlessly during your mid-project madness. And another team member with Achiever drives you to get-it-done status by keeping an eye on the finish line for each milestone. As long as you’re meeting the outcomes, it doesn’t matter which talent gets you there. And finally, here’s reason #5. This one is, in my opinion, the most powerful of all. It’s that your hiring decisions take into account a lot of factors about a candidate. You interview someone to vet their Knowledge, Skills, Experiences, and Talents. Sometimes people get so zealous about the talent themes that they forget about super important knowledge, skills, and experiences. A lot of times, you have critical timing factors as well. So for example, say you landed a big contract with a client. Your marketing team is creating a piece of cutting edge geo-targeted advertising software. You need this person yesterday (isn’t that always what it feels like?). If you hired by talent themes, Madison’s Command and Focus would tell you she’s the one. But if you consider Abraham’s specialized coding languages, his experience with the client’s specialized urban agriculture industry, and the knowledge and skills he built in the last 10 years in marketing, it sounds like a no-brainer that Abraham will be a top candidate. So remember: even though talent is important, it’s only one of many factors. 1: On your existing team, have a conversation about how to partner up the talents you already have. In combination, they can act like the ones you’re missing. 2: On your existing team, remember to focus on your team’s strengths and easy buttons. Your talent gaps can stand out on a chart like a sore thumb and lead you to obsess over what you’re missing, yet if you’re building a strengths-based team, you’ll want to focus on leveraging what you do have. 3: For the role you’re hiring for, come up with questions that get to the thing you need. So, if you’re lamenting the lack of planning on the team, rather than only considering candidates with the Focus or Discipline talent, ask questions and open conversations that get to similar outcomes. Tell me about a time when you took a complicated project from start to finish. What’s your process for creating project timelines and communications? How do you keep yourself accountable to your commitments? Tell me about a situation when you were given an unrealistic deadline for a product launch. You get the idea here. Think of the things that you want from the talent theme you don’t have. And then ask about those things. You’ll find that people can get to those same outcomes through many different talent themes — and the label doesn’t matter as much as the result. To get more of these strengths-focused conversation starters, check out our resources page — there are a bunch of tools related to StrengthsFinder, strengths-focused leadership, and on noticing what works so you can get more of what works.